Although the CSBuoy-DT Water Quality Platform System was retired on January 5, 2010, some replacement parts remain available. Campbell Scientific's CSBUOY-DT is a wireless, floating, self-contained package that allows fish farmers and water resource managers to monitor critical water quality parameters from the convenience of their office. 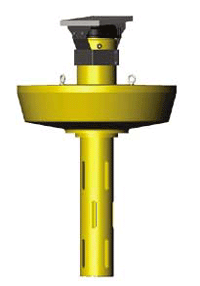 The CSBUOY-DT is not suitable for wave or tidal environments. The CSBuoy-DT consists of a buoy, internal CR206 datalogger with 900 MHz spread spectrum radio, an antenna, a sealed rechargeable battery, a 5 Watt solar panel, dissolved oxygen sensor, agitator brush (to generate water flow past the sensor), and a temperature probe. The onboard transceiver sent data to an onshore base station or the manager's office. The internal data logger was preprogrammed to measure the connected sensors. The buoy requires a minimal amount of setup and can be deployed anywhere on the pond. This self-contained package can be easily moved from pond to pond.